If it's fish you're after, then you'll get some of the best fishing around. Lake Wappapello is home to some of Missouri's most popular game fish. 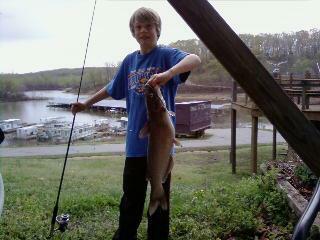 Featured species include: White Crappie, Black Crappie and Largemouth Bass. Other species that can be found are Channel Catfish, Flahead Catfish, Blue Catfish, Kentucky (Spotted) Bass, White Bass, Bluegill, Redear Sunfish, Green Sunfish, Warmouth, Drum, Walleye and Gar. 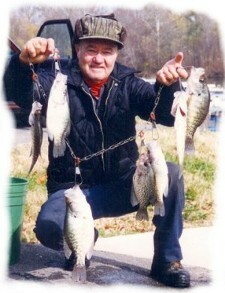 CRAPPIE - Average size ranges from 9 -11 inches with many good size keepers caught year round in the 2 - 3 lbs. range. Black Crappie has increased in numbers and now accounts for almost 40% of the population. While minnows are always a "must have" for any Crappie fisherman, artificial lures are also a good bet with the favorite being small tube jigs. Crappie spawn at Wappapello Lake takes place between April and May with the species seeking vegetation, sticks, logs and stumps for cover. In general, shallow points and coves are ideal places for Crappie to spawn. 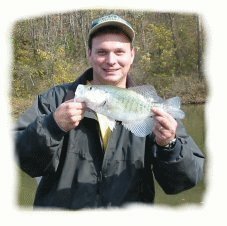 As summer approaches, Crappie tend to move deeper and can be found in flats near river channels. Crappie head to the shallows early morning and late afternoon for better feeding opportunity. Fall and winter Crappie fishing should concentrate on deeper depths of 10 -12 feet. Cool weather causes this species to seek larger flats located near river channels. 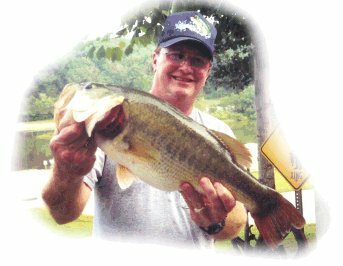 LARGEMOUTH BASS - If you can't shake the winter blues and are just itching to go "Hawg Hunting" then you'll be glad to know increases in catch frequency can start as early as March. From March - May, crankbaits, Jerk baits, Rattle-Traps and "jig-n-pigs" are favored. Spawn takes place in May with the species prefering the ease and use of natural points for foraging in and near the shallows. During the post spawn season and through summer, top-water lures are preferred. Buzz-baits, torpedoes, crippled shads and other prop baits have always proved successful in creating an impressive and explosive strike. Spinnerbaits get plenty of work for fall bass fishing with emphasis on chartreuse and white skirting. For Winter catches bends and edges of channels are sought using 10 -15 ft. crankbaits while some prefer a dark colored "pig-n-jig." WHITE BASS - During the annual spring spawn, White Bass can be found heading up the St. Francis River system. As on any lake, Beetle-spins and jigs are the weapons of choice. 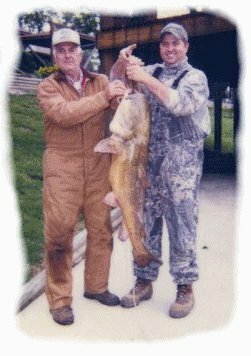 CATFISH - Throughout the year, limb, stump or trot-lining styles are frequently used with varied baits such as: Chicken liver, cut baits, and full variety of artificial stink baits. During spring spawn many fisherman can be found near the front of the dam or spillway continuing the St. Francis River.